Cup holder, eh? I like cups. Who doesn’t? If you constantly find yourself in need of a 22 inch wide glass shelf with a built-in three-port USB hub and cup holder attachment, then today is your lucky day. 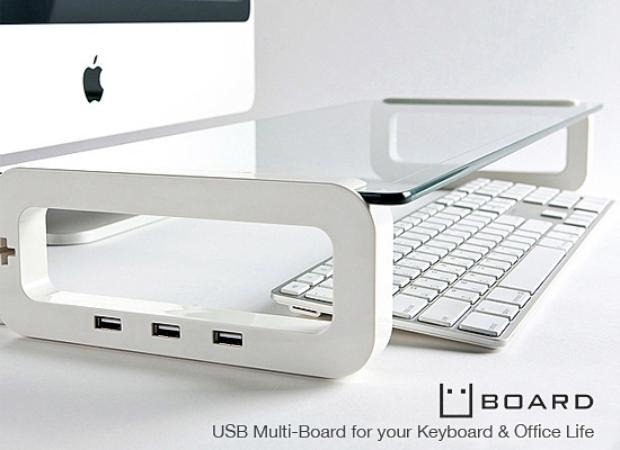 The $50 UBoard is pitched as a “USB Multiboard For Your Keyboard & Office Life.” I don’t know about you, but I like to keep my keyboard life and my office life separate. It’s hard to do, but it’s important to me. The tempered glass shelf can hold up to 33 pounds, but the product page recommends that you should not sit or stand on it. I agree, in principle.